Discover the beauty of the Red River Valley. Nestled in the cool northern New Mexico Mountains, the Road Runner RV Resort offers 120 RV sites featuring full hook ups, DirecTV, Wireless Internet and many sites along the river. Relax under the trees, fish on the beautiful river or play a game of tennis. Located on 20 acres, Road Runner RV Resort is the perfect vacation destination. The resort is located on the east end of the Red River, about a mile from the center of town. It's the perfect home base for your Red River Valley adventure. Book an RV site today. 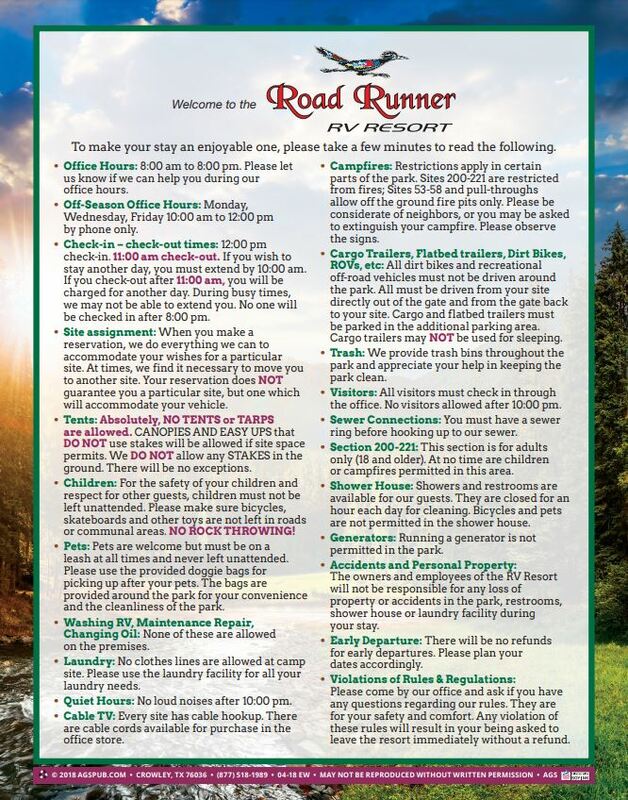 Road Runner RV Resort is a 23-acre RV park located in Red River, NM. For almost 40 years, we've been welcoming guests from all over the United States and beyond. Harold Young was one of the original homesteaders in this part of Red River. He turned 23 acres of his property into an RV Park in the early 80s. The current owners have been operating the park for six seasons, and they are proud to be a part of the heritage of the Red River Valley. We are located on the east end of Red River, half-a-mile past the stables and about a mile from the center of town.